Carleton Place, Ont. – Dealer Mitch Coutu bought the long-standing Carleton Place from Mike Pitre on April 8. The deal took 10 months to complete. Coutu, who owns the thriving March Group Premium Vehicles in Bells Corners, renamed the dealership March Ford. 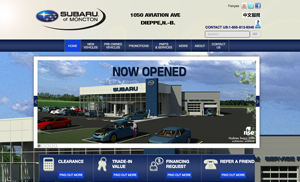 The dealer has 30 years experience, including the last eight in auto retail. Bringing new energy and funds to the table, he noted one improvement customers will see right away is more inventory on the lot. Another improvement will be the addition of a fixed ops manager and a receptionist. Coutu said the dealership is proud to be the first authorized Roush Performance parts dealer in the area. Roush is best known for its line of high-performance Mustang powertrain parts, including our superchargers, exhaust kits, brakes body kits and a full line of wheels, tires, interior, grilles, graphics, service parts, accessories, drivetrain and cooling upgrades. In addition to Mustang, Roush also makes performance upgrade packages for Ford F-150, Superduty, and Focus. Coutu said he is a firm believer in giving back to the community, and promised March Ford would be involved in community activities with wife Nicole Novotny leading the charge. “Nicole is the face of the business in the community,” he said. 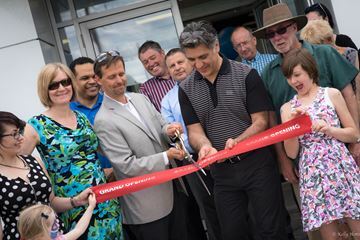 The grand opening took place on June 4.